With the spring melt finally upon us; it is a great time to take a look around your property and take care of some spring home maintenance. It is easy to see where water is running and pooling. The ground around your home should slope away on all sides. This is also very important near window wells, patios and basement stairs. If a slope is not present then you run the risk of water intrusion in your home. This could lead to mold, foundation cracks and moisture. With spring showers it is an opportune time to see how your gutters, grading and downspouts are performing. 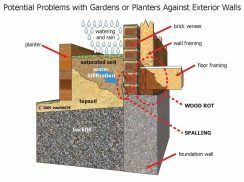 You will want to ensure that they are driving water away from your foundation. You will also want to check that your gutters are free from debris such as leaves, building materials, etc. If downspouts are blocked, water will run directly off the roof damaging the ground below. Downspouts need to be positioned so that they do not flow directly over walkways, driveways or stairs. In times of heavy rain the force of the water leaving your downspout can cause damage to the soil or earth. It is recommended that you protect your grade with a drainage shoot or splash blocks. 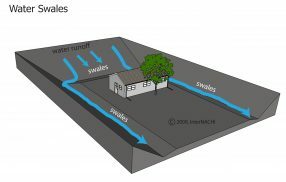 If your home is on a hill often times you will have a swale (also called a ditch). It is important to ensure that they are clear of leaves, grass and other debris which could cause blockages and prevent the water from flowing away from your home. Planters and flower beds add to your home’s curb appeal but can also add costly repairs. You will want to ensure that planters are not placed against the homes exterior walls because the soil acts like a dam and will trap water. Sump pups are meant to move water away from a house to an area where it won’t cause problems. Sump pumps should not recycle and you should check that water is draining away from the building. Now that you’ve completed some simple home maintenance it’s time to sit back and enjoy the warmer weather.